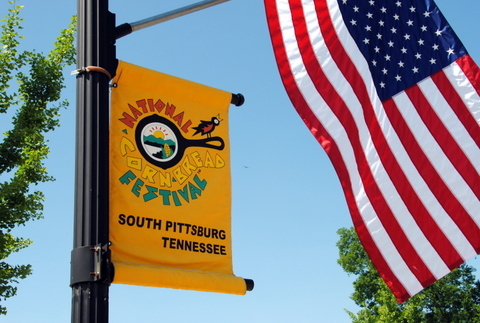 The NATIONAL Cornbread Festival celebrated its 15th year when I visited in May 2011. Way to go South Pittsburg, Tennessee to have a national presence! And a presence it did have: thousands upon thousands of people and even a newspaper printed just for the occasion. Personally I don’t think that was necessary, nor did they need live web-streaming, but they had all media platforms covered and gosh dernit they were gonna use em! It’s a truly glorious festival with giveaways from Martha White, carnival rides, greasy food, and spectacular people watching. The true gifts were hidden away at the poorly attended bluegrass tent where men who had worked hard their whole lives found joy in music and happened upon a young boy who could play and sing with a soul much older than he. How do you harmonize when you’ve only just met? Of course there’s a cornbread bake-off. They do it with a twist: add variety to the traditional recipe. I wasn’t a fan. If it ain’t broke, don’t fix it and I just wanted heaping servings of warm decadent cornbread. 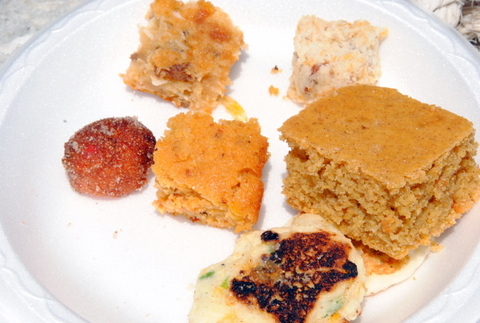 Instead there were sampler sizes of chicken chive cornbread flaps, Hawaiian cornbread fritters, and Tooti Fruity cornbread balls, among others. I sat in the corner of the eating tent, curled myself into a cornbread ball and wept. And then the eating contests. A race for freezing cold ice cream, and to see who can force down “cornbread” minus sugar, liquid, and other ingredients that make it palatable. The things we’ll do for a t-shirt! Sounds like a pretty cornball sort of place to me. Hope you had a wonderful time. Sounds like you had a pretty good 4th.